Clint West (real name Clinton Guillory) was born on August 11, 1938, in Ville Platte. At thirteen, West was playing drums and singing Cajun and country songs with a band from his home community, the Vidrine Playboys. In the late 1950s he began to perform swamp pop as a member of Red Smiley’s Vel-Tones (with fellow swamp popper Tommy McLain) and recorded his first record, “Lover Blues/Take a Ride”. In 1959 West moved to Monroe to join the Rollercoasters, but returned to south Louisiana shortly to become a member of the Boogie Kings, a “blue-eyed soul” group originally from Eunice that was a top drawing band in the region. Around 1965 he left the Boogie Kings with other members to form a rival group, the Fabulous Kings, and eventually performed as a solo artist. 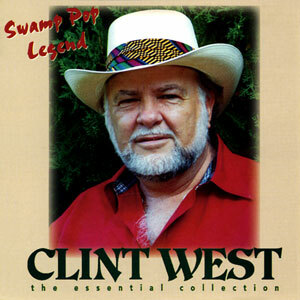 West recorded for the Jin label of Ville Platte, issuing classics of the swamp pop genre like “Big Blue Diamonds,” “Please Mr. Jeweler,” and “Try To Find Another Man” (all 1965, the latter a duet with McLain). He has twice been inducted in the Louisiana Hall of Fame, once as a vocalist, and once as a member of The Boogie Kings.